For an instant, everything slowed down and came sharply into focus. I noticed that the sunlight in my kitchen was sliced by window blinds that were halfway open. The wooden table had ribbons of light and shadows fanned across it and I was aware of how bright and warm it looked outside. Then everything shifted. My apartment felt cold and when she repeated the sentence, the words became a roar, each one echoing in my head. The confusion lifted quickly. Then everything shifted again, as the words took on meaning. The roar quieted. The ribbons disappeared into simple shadows. Nothing beyond the window looked bright. As much as I wanted to reverse time to the moments before I answered the phone, so I could linger in what ‘before’ felt like, I found myself propelled forward by events well out of my control. The one instance I know I displayed unrestrained emotion was when we were deciding on the wording for the headstone that would mark my father’s grave. My sister thought it should read “In Loving Memory” and I thought it should read “In Fond Memory.” It was a shouting match that brought us both to tears. I was forceful and angry. She was outraged and determined. She argued that you are fond of dogs, that you love fathers. I argued that loving fathers don’t abandon their children. We were both right. My father was an active alcoholic. I have no awareness of a time when alcohol didn’t factor into our lives in one way or another. Every element in our house revolved around my father and his disease. My sisters and I grew up understanding that while we were loved by our parents, neither was dedicated to the task of raising us. So we took care of ourselves when we needed to, and, as circumstances required, took care of him. On any given day, he was more likely to be drunk than sober. We grew up learning to anticipate my father’s condition and adjust our behavior. We developed a remarkable ability to gauge the mood of our house by smell. To this day, I can single out a vodka drinker in a crowded elevator. The vigilance we felt obligated to maintain was even more intense outside our home. My father would show up intoxicated at some events we were participating in, and be sober and fully present for others. There wasn’t a pattern, so we were never able to predict what would happen. We learned to be prepared for anything. Our sole priority was to control the secret of his alcoholism as much as possible. As a result, I never had the thrill of feeling protected and carefree. Growing up early robbed me of an understanding that vulnerability is not a failure and trust is not a weapon. Still, he was my father. And I loved him. I loved him so much that I thought it would be enough to change him. We all did. Giving up on him was never an option. Perhaps it was seeing my mother refuse to give up on him, as well as the feeling that there was something we could do to fix him, but we never accepted that the disease was stronger than we were. We never accepted that it was solely his battle to fight. We were wrong. I spent time with him six days before he died. It was late January and the divorce my mother filed for was finalized earlier that same month. He had moved out of the house and found a temporary place to live. I was twenty years old. He was forty-eight. We had spoken on the phone, a couple of times in fact, but I needed to see him. I had no particular reason to want to see him, just a solid need. So I skipped classes, drove the three hundred miles south, and met him one evening after he was finished with work. The drive was uneventful—that is to say I honestly have no memory of it. I am sure there was a cd playing, I’m sure I was mindful of the traffic, I’m sure I had snacks or at least a soda with me. I’m also sure that I was preparing for whatever I found when I saw him. Bracing myself was second nature when it came to my father, I was used to him at his worst. Given that he had been made to leave the house he loved, agreed to end his marriage, and now had to look for a way to start over, his worst is what I expected to find. The motel he was staying at was conveniently located near the only liquor store in town. It was also close to a supermarket as well as to the printing shop where he had managed to keep his job for years, primarily because of the kindness of the family who owned it. When it came into view, I signaled a left turn and entered the parking lot. Made of cinder block and painted white, the single-level building had warped plywood doors and red trim around the windows. The trim was peeling off in thick, matted chunks. The tattered marquee listed only weekly rates. Smoking and non-smoking rooms were available. The neon vacancy sign was lit. Even the asphalt was cracked. The outside reeked of decay, of travelers who’d ended up there, most out of options and many also out of time. I parked my car. Turned off the ignition. Gripped the steering wheel. Closed my eyes. I hated that I was visiting my father in this dismal place. 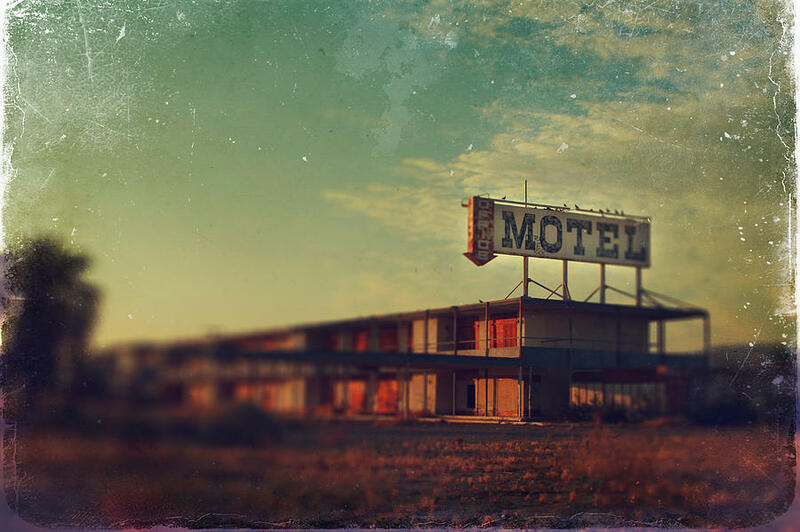 It was the type of motel people went to when they had nowhere else to go. I took a breath, grabbed my bag and gave myself one quick look in the rearview mirror. I needed to look composed, and I did. I stepped out of the car, guarded, cautious, ready to be expressionless if I saw a marked deterioration when he opened the door. Then I knocked. He opened the door before I finished knocking. But he wasn’t drunk, he wasn’t angry, he didn’t even seem particularly depressed. He was happy to see me and asked me to come into the room. I was happy to see him sober and entered. The room was poorly lit and appeared especially gloomy because of the wood paneling on all four walls. Clothes were draped over the only two chairs, pants on one, shirts on the other. The bed was partially made. It was clear he was sleeping on the right side of the bed, the other side looked untouched. I remember thinking how odd it was that he wasn’t sleeping on the left where he should have been; instead he was sleeping on my mother’s side. He began taking clothes from the chairs so that we could sit and talk. I could see his hands shaking as he tried to make a place to sit. I said it was okay, that we could just sit on the bed. So we sat. Side-by-side. My bag near my feet on the floor. Both of us facing the dusty window. The curtains were open, but it didn’t make a difference. Based on the amount of light it gave off, the lamp on the nightstand was for decoration only. The cheap plastic ashtray next to the lamp needed emptying. I saw a collection of blood-stained tissues in the small garbage can on the floor next to the bed. It was not unusual for my father to have nose-bleeds, he’d had them for as long as I could recall. They are a common indication, I later learned, of alcoholism. I wondered just how much he was drinking now that he was not home. The threats of leaving, of making him leave, were issued for years. The drinking didn’t stop. Then suddenly the threats were no longer empty and here he was. Though there were no signs of alcohol in the room, the air inside was heavy with vodka and smoke and perspiration. It was a nauseating, diseased smell. I hadn’t lived at home for nearly three years and had forgotten what it was like; the room smelled like my childhood. We began to talk. It was more small talk really. He wanted to hear all about my classes (liberal arts focused), my grades (outstanding), my boyfriend (going well), my part time job (not too stressful). The conversation was not tense, not at all difficult. If a stranger overheard us speaking, it would have sounded like a typical father and daughter chat, perhaps it would have even sounded boring. But it was far from casual. In the midst of talking, I tried to take in all of the details in an attempt to make sense of what had happened with my parents. It made sense that after years of living with an alcoholic, my mother could no longer accept the disease. It made sense that they divorced. It made sense that he moved out and came to live in this nameless place. It all made sense, but none of it seemed real. It felt out of my control and unlike when I was younger and everything that happened in our house was kept in our house, events had been set in motion that would have implications in the world beyond our front door. I needed to see him that day to determine what the implications would be. I was assessing everything about him, his body language, his speech, the state of his clothing. I wanted to memorize every detail. The conversation trailed off and I stood up and moved toward the small writing desk. It had a mirror hanging above it that was as tired-looking as everything else in the room. My back was to my father but I could see him in the mirror’s reflection. He was still looking toward the window. We were both quiet, him staring outside, me staring at him in the mirror. I saw his head turn toward me. I lowered my head before our eyes met in the mirror. I don’t remember any of the sentences he spoke, just phrases: “my drinking,” “everyone tried,” “my fault,” “I love your mother,” “proud of your sisters,” “proud of you.” I didn’t want to create the slightest disturbance in the flood of words. I didn’t want it to stop. And I didn’t want to cry. So I focused on tracing the lines of the telephone with my finger, feeling the spaces between each button. Just as abruptly as he started speaking, he stopped. It was still daylight when we stepped outside. The fresh air and sunlight felt almost overpowering. Even though the dark room was stifling, it felt familiar. My father had always smoked, but he never smoked inside at home because we were around, so it was second nature to both of us to head outside if he wanted a cigarette. He took the lighter from his pocket, but before he lit the cigarette, I wrapped my arms tightly around him. I buried my head in his shoulder and held on. He held on just as tightly. I wanted to breathe him in, to imprint the smell of sweat and newsprint and nicotine on my brain. I told him I loved him before I finally let go. Then he let go. He lit his cigarette as we said goodbye. There were no assurances passed between us, no half-hearted plans to meet again. He actually thanked me for coming. I wanted to say “Of course I would come” but I didn’t. When he thanked me for coming, I knew. In that moment I realized that sometimes love can’t outrun disease, no matter how much you want it to, and there was absolutely nothing I could do. I got into my car with the realization that I was seeing my father alive for the last time. I have no idea if he had already planned his course of action when he spoke to me that day or if it was more spontaneous. Less than a week later he would park his truck outside the house he had lived in for more than fifteen years, turn off the ignition, remain seated behind the wheel, rest his right temple against the barrel of a rifle and pull the trigger. Just like that, it was over. He left no note. It wasn’t a jolt when he died, it was more of an extended boom, like elements inside me suddenly realigned. I alternated between feeling as if my core was being scraped raw by a jagged knife and feeling as if I were being siphoned away from somewhere deep inside. And as much as I recall the jumble of moments leading up to the funeral, looking at his body, pulling my sister from the casket so they could close it, I can’t recall showing any outright emotion beyond fiercely efficient tears. The fact of his death washed through me, leaving no cell untouched. Days were marked in degrees of ache, not by any calendar. I took nearly a month off from school, and my time was spent slowly catching up to the rest of the world. By the time I went back, I had perfected the art of detached storytelling, a quality that many still find unsettling, and I had learned how to function with a hole inside of me. My father has been dead for more than half my life, but I suspect I will always feel the vibrations created by his suicide. There is no getting over it; his death wove itself into my fabric. I live in a shadowy place where fathers leave, where fathers choose to leave. I also live in a place where time definitely does not heal wounds, where it doesn’t even try. Part of me will always be stuck in that parking lot, feeling powerless in the face of his end. On my worst days, I am the girl who wasn’t good enough to keep her father around. On my best days, those smeared together events are so far in the past that it feels like a different lifetime. Most days I am somewhere in between, feeling broken but not irreparably so…furiously focused on keeping myself steady in the ripple he created. Afloat on such pain that I still find it hard to simply cry. ANGELA GILES PATEL has had her work appear in The Healing Muse and on The Manifest Station as well as The Nervous Breakdown. She tweets as @domesticmuse, and when inspired updates her blog: //airhunger.net. She lives in Massachusetts where she conquers the world, one day at a time. Beautiful. Thank you for allowing us to peek into your memories. I’m speechless. This too my breath away. So beautiful. You are a tremendous writer, and human being. I am so sorry for your losses- but my God, for you make beautiful art. Sending love and and clapping at your brilliance and bravery and artistry. There was some bravery involved, but I think that some of the best things we do involve letting ourselves be vulnerable. Thank you for reading. Thank you so much for sharing your experience & your strength. You have found a gift through all of it…and for that you are truly blessed. Bravo, brave soul. Bravo! Thank you for your comment and for reading my piece. I’m absolutely stunned… this was beautifully written. You are so brave and so very talented. Thank you so much for sharing your gift with us. Bravery can be wonderous as well as scary. Thank you for taking the time to read. Thank you for your wonderful comment. I am humbled by it. I appreciate you taking the time to read my piece. This is easily the most memorable and moving essay I have read this year. Thank you for sharing your gift with the world. This touched my soul. I heard those words, too. Actually, I didn’t exactly hear them. I heard my brother sobbing and somehow knew what had happened. I think I dreamed of my father’s death the night before, or maybe two nights, but I can’t be sure. I have very little memory of the “before.” I also remember being stoic and calm at first, whether or not I actually was. I remember my grandfather telling me my father died, waiting for a reaction which I did not give, then asking me if I wanted to know how he died. I shook my head no and said, “He killed himself.” I had just turned 13. The way you describe how everything slowed down – how the world shifted. Like you, I remember that moment in vivid detail. I heard my brother crying, wondered why for a moment, then the knowledge of what had happened – what must have happened – flooded me. I remember exactly what I was looking at when that realization came: a staircase in my house, viewed from a particular angle to my right. It has no significance at all, but it is burned into my memory forever. The red carpet covering it. A slant of light from the window zig-zagging up the first and second stairs. The sound of my little brother sobbing. The way you describe the shifting from emotion to emotion, world to world, confusion to rage and everywhere in between, in a span of seconds that felt like ages – as though within a split-second the entire universe was torn apart and re-assembled into something that looks exactly the same, but into something so dark and empty, something I could hardly believe could be real. Dizzying. And most of all, the way you describe the hole. Now, 28 years later, I still live with that hole. Sometimes (like right now) it is large and looming. But more often than not it is a distant ache in the back of my mind and soul that I can almost forget. Almost. Perhaps one day I will be able to forgive him, and then maybe the hole can close a bit more. Lord knows I’ve tried to forgive, but I don’t think I’ve really done it yet. Thank you so much for writing and sharing that piece, Angela Giles Patel. It is wonderful. I hope you don’t mind me commenting in this way. Writing like this always makes the hole close just a little bit. I appreciate the detail in your comment and am grateful that my essay spoke to you. We never fully heal, but getting used to the wound (or even a little more used to it) can be a huge victory. Thank you for reading. Thank you. I am always surprised at how similar the experience of those who live through aparent’s suicide. I was 20 when my father killed himself. I was the one,however in complete control because that was my family role. I too had had a visit with my father 2 days before. I pray that you will continue to find healing and joy in life. I know that I am grateful for each day and the surprises that come into it. Thank you for your comment. I am sorry that you understand the situation I wrote of as well as you do. I appreciate your reading my piece. Just beautiful. Every word and the way you put them together. Yes, alcoholism is a terribly cruel disease that impacts far more than just the individual. Thank you for taking the time to read. Your closing words about worst days, best days, and most days also strike a chord with me. Thank you for sharing this. My father committed suicide when I was 8. He shot himself. I can say it was difficult. I am now 39 and feelings have resurfaced since I had 2 children. My favorite cousin just went to a hotel and shot himself less than a year ago while I was pregnant. We appear to have a suicide gene in our family with males. it scares the hell out of me. I thank you for sharing and not being scared to share, for being up front and honest. My daughter is 2, my son now 6 months. They know of their grandpa being sick. Just not why. We talk of him regularly. Again I thank you. You completely captured the trauma and pain of what the children of alcoholics typically experience. The following sentences, more than any other, resonated with me. They were my sister’s and my life, too. Thank you for being brave enough to dig so deep and unearth this amazing jewel of an essay. It should be required reading for people in Al-Anon and AA. Angela, I am glad I found this tonight. You are a great writer and it seems also a brave human being. Nothing like this has happened to me in my family circle, although we have had deaths caused by disease, by accidents, and old age. The descriptive way this was written took took me to my fathers death and I thought, “What if”. My heart sped up and I temporarily stopped breathing as I mixed my experiences and emotions with what played in my mind. I know my imagination isn’t equipped to create the overpowering heartache described here but I experienced a deep sadness and my chest and throat ached for all those children, spouses, and mothers (parents) who have known it first hand. Thank you for sharing such a very personal, tragic experience in a way we can try to understand the pain of both the before and the after. Read through the whole essay and I am not a good reader. Makes my life look much better compared to what you have gone through. Thanks for sharing. This was simply so moving. I can almost feel the sadness your father felt. The self-blame, the hopelessness. It’s so hard to work and raise children, particularly more than one. You’re a fine, fine writer. Bravo. This is brave and beautiful, Angela. Every once in a while you find a piece, and from the first line or two you are in it completely and only come up for air when you’ve finished. This was one of those rare gems. Raw and brilliant. So exquisitely crafted. I hadn’t seen this until today, when you told me that the subject of my writing was a close one to you, I knew that you knew. This was beautiful. Thank you. Much love.